One of the supported deployable database formats in Delphi XE8 Firemonkey (and previous versions) is SQLite. The upgraded SQLite support in XE8 is available on Android, IOS, OSX, and Windows. There is a utility by PremiumSoft CyberTech Ltd. called Navicat for SQLite which can greatly speed up your workflow when dealing with these SQLite database files. 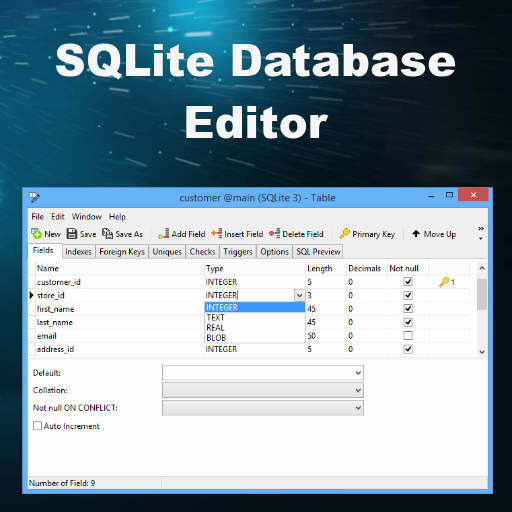 Navicat for SQLite is a full featured database editor where you can create databases, design tables, import/export data, and finally deploy the databases. Navicat also has versions for managing MySQL, SQL Server, and other databases (I use it every day). Where Navicat for SQLite can really accelerate your workflow is that you can create your tables in the SQLite database file, load them up with data, and then use LiveBindings in Delphi XE8 to preview your mobile app data at design time. The SQLite database format includes a BLOB field type. You can load up JPEG images into the BLOB field type and then using LiveBindings to populate your TListViews in Delphi XE8 Firemonkey. This works great for the multi detail view of TListView where you can define 4 text fields and an image. TClientDataSet and TFDMemTable can also be used for this purpose. Navicat for SQLite is a commercial product but there is a 30 day free trial so you can download it and start using it right away. Appmethod and C++Builder also support the SQLite format. Head over and check out all of the features of Navicat for SQLite before downloading the free trial.